A couple times a year we hold an old fashioned quilting bee. 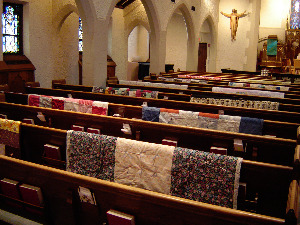 The quilts then blessed and sent to Lutheran World Relief for distribution to people in need. This group meets every Tuesday morning from 9:30 am to noon. From three to five ladies have worked on these quilts weekly and have finished many tied quilts to give to the shelters in the area as well as hand quilted quilts done for private individuals with the money going to service recipients. The quilting group would like to have others join them, so if you are interested in quilting or tying quilts, please talk to Nancy Budrevich, 515-255-4030 or Barb Hyler, 515-401-5721. There is a Quilters Fund if you would like to donate for the cost of materials.